After making 52 saves Saturday, which tied his career high and ranked as the second-most stops in a game for a Wild goalie in franchise history, Devan Dubnyk will have a little more time to rest and recover. 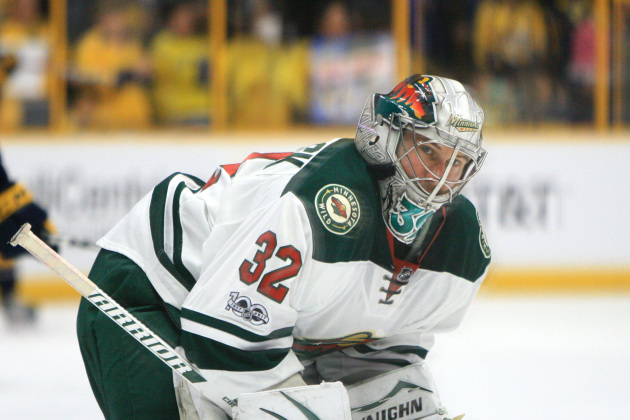 Backup Alex Stalock is poised to make his first start of the season when the Wild takes on the Predators Monday in Nashville. “I’ve been feeling good in practice and stayed healthy through training camp,” Stalock said. “I've done everything I can to prepare for this. So go in there, make some saves and come out with two points." Coach Bruce Boudreau noted Stalock’s performance at Bridgestone Arena when explaining why Stalock earned the first game of the back-to-back instead of the second, which is Tuesday at Xcel Energy Center against the Coyotes. Stalock has given up just two goals in each of his last two appearances in Nashville. “I give credit to our team,” he said. “I know last year we were 3-1-1 against this group, and they're an ultra-talented group. That speaks a lot about our group, the way we can play against these good clubs, and hopefully we keep it going tonight. It's a division game and you see how our division is going to play out all year, so every point is valuable." The lineup in front of Stalock will look the same as the one the Wild rolled out Saturday in that 5-4 overtime loss to the Hurricanes since the team did not make a call-up from the American Hockey League with center Joel Eriksson Ek out with a lower-body injury. With another game on tap Tuesday, it’s possible, though, the team does add a reinforcement before facing Arizona. 3: Wins last season for the Wild against Nashville. 5-1-1: The Predators’ record vs. the Wild in their last seven meetings in Nashville. 4: Points for defenseman Ryan Suter in the last two games. 8-6-1: The Wild’s record in the first game of a back-to-back last season. 8: Skaters for the Predators have at least three points. Nashville has had a strong start, accruing eight points amid a 4-1 record. The team’s top line has been a major catalyst. Wingers Filip Forsberg and Viktor Arvidsson and center Ryan Johansen have combined for 14 points. All three have three points in their last two games. In net, Pekka Rinne has been solid – posting a .946 save percentage and 1.67 goals-against average.